The Purana literature is described to Vedavyasa are uniformly stated to be eighteen in number. They are also works of evidently different ages and have been compiled under different circumstances, the precise nature of which we can but imperfectly conjecture from internal evidence and from what we know of the history of religious opinion in India. The Vishnu Purana, 'That in which Parashara, beginning with event of the Varaha Kalpa, expounds all duties, is called the Vaishnava Purana; and the learned know its extent to be twenty-three thousand stanzas. This Purana is divided in the six books, in which the first is occupied chiefly with the details of creation, primary (Sarga) and secondary (Pratisarga); the first explaining how the universe proceeds from Prakriti or eternal crude matter, the second, in what manner the forms of things are developed from the elementary substances previously evolved or how they reappear after their temporary destruction. The second book opens with a continuation of the kings of the first Manvantara; amongst whom, Bharata is said to have given a name to India, called after him Bharatvarsha. This leads to a detail of the geographical system of the Puranas, with mount Meru, the seven circular continents and their surrounding oceans, to the limits of the world. This also contains of the planetary and other spheres, is equally mythological, although occassionally presenting practical details and notions in which there is an approach to accuracy. The arrangement of the Vedas and other writings considered sacred by the Hindus, being in fact the authorities of their religious rites and belief, which is described in the beginning of the third book. The fourth book contains all that the Hindus have of their ancient history. It is a tolerably comprehensive list of dynasties and individuals; it is a barren record of events. 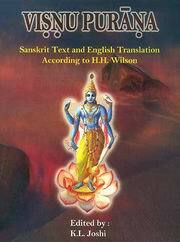 The fifth book of the Vishnu Purana is exclusively occupied with the life of Krishna. This is one of the distinguishing characteristics of the Purana and is one argument against its antiquity. The last book contains an account of the dissolution of the world, in both its major and minor cataclysms; and in the particulars of the end of all things by fire and water, as well as in the principle of their perpetual renovation, presents a faithful exhibition of opinions that were general in the ancient world.